An archaeological discovery, the Augusteum dates back to the Roman era in Cartagena. After studies and research by conducted by archaeologists, it was deciphered that the building structure was used as a college and a temple dedicated to the worship of a religious cult inspired by the Emperor Augustus. If you are unaware of the history of Cartagena during the Roman empire and the religious cult of Emperor Augustus, don’t worry, the museum has excellent audio visual presentations which portray the details. Although the actual museum is wheelchair accessible, the entrance to the museum is via a flight of stairs. Free entrance for kids under 3. How popular is Augusteum Roman Museum? 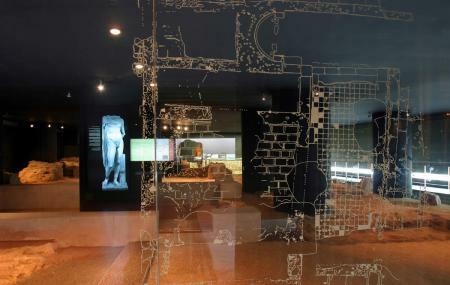 People normally club together Roman Theatre Museum and Museo De La Muralla Punica while planning their visit to Augusteum Roman Museum. Impressive. Archeological site which has marble that is still polished and shining. Amazing place to jump into ancient Roman history. Good museum of a temple dedicated to the deification of Augustus, Octavian emperor. David, the caretaker is extremely knowledgeable and kind. He can answer literally any history question and if not busy would gladly talk to you about the history of Cartagena and beyond!! When compared to other museums in Cartagena, the augusteum falls well short. What should be an interesting museum lacks interest. An enjoyable time being able to walk around the ruin whilst they are still uncovering hidden mystery's.